Virtual reality tech allows the spacecraft to appear superimposed on iPad, iPhone or iPod touch screens. Ever fancied yourself controlling one of NASA's robotic spacecraft? A new app from the agency's Jet Propulsion Laboratory (JPL) let's you do it. This week, the lab released an app for the iPhone, iPad and iPod touch called Spacecraft 3D. The app uses technology known as augmented reality, to overlay virtual images on real-world objects — in this case, a piece of paper. Printed on the paper is an image from an Oregon sand dune, which JPL says simulates the terrain of Mars. When the user centers the camera view within the app on this image, a virtual 3D model of the selected spacecraft appears onscreen. 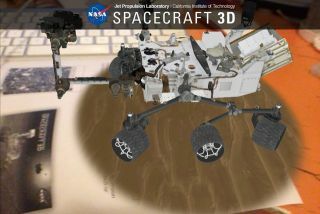 Spacecraft 3D includes models of the Curiosity rover, due to land on Mars on August 6, and of the twin Ebb and Flow satellites that are orbiting our Moon. Moving the camera around the image on the page allows you to move around the 3D view of the spacecraft. While the GRAIL model is basic and allows you only to move the camera angle around the spacecraft itself, JPL has added some nifty extras to the Curiosity rover model. For example, you can extend and retract the rover's robotic arm, raise and lower its camera mast, maneuver the high-gain antenna and even turn the rover 90 degrees to the left or right. Hold the paper in your hand, and it's literally like having a miniature spacecraft in your palm. Spacecraft 3D also includes an option to take screenshots or enlarge or shrink the model for closer inspection. Future plans include virtual models of the Cassini spacecraft, which is currently in orbit around Saturn, and of the asteroid-bound spacecraft Dawn. A future release will also include models of the Voyager satellites, one of which is about to become the first spacecraft to exit our solar system. While users with Android devices won't be able to download Spacecraft 3D initially, JPL says that the app will be available on that platform and possibly others in the "near future."